Crowdfunding is in! Everyone is using Indiegogo or Kickstarter. What’s so magic about it? Is it really working? Those are the questions I plan to disclose in this chapter. Is this the right way or do you work with your fiscal sponsor and do a well-thought-out funding campaign through the fiscal sponsor or just use a fiscal sponsor that Indiegogo allows you to use or forget the fiscal sponsor? What’s right for you? 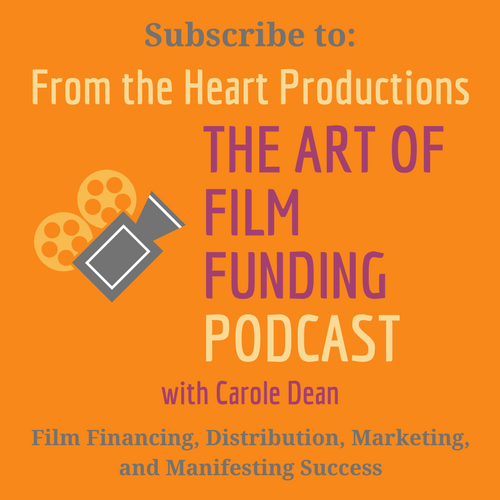 One excellent reason that crowdfunding is working is because they took the basic concepts for film financing and put them together for you. They are teaching you how to raise money. You still do all the work but now you have a list of proven things to do to create your platform. You can show your trailer and make an “ask” online with thousands of other filmmakers. I wonder if people sitting at home with their first cup of coffee are thinking, “I should donate to a good filmmaker today, so I will go on Indiegogo and find some place for my money.” I doubt it. It’s getting something in your inbox that is very personal, from the filmmaker. It is a heart-felt plea saying we are close to our goal, please help us. We need this money for my film, In Search of the Sacred and you can help us finance our trailer with your donation. That’s what is working. It’s the emails flying from one person to another. It’s people reading your compelling “ask”. The donations are coming from people in their comfortable homes where they can click a button and send you money very easily. It’s the filmmaker being able to tell us the essence of their film from a short pitch and a brilliant trailer. This is opening pocket books across the globe. I bet that the largest dollar donations are in the $20 to $50.00 range per donation, but we will ask Danae in our interview. for you and are telling you exactly what to do and when to do it. You still do all of the work if you have your film on the crowdfunding site or on a fiscal sponsor’s site, it’s up to you to drive people to make the donation. Can you do this with your own web site and get the same amount of buzz and money? That’s a good question. Let’s outline what you need to do to raise money with or without a crowdfunding company. Ok, Carole, we know all this, where are the tricks to funding? Never ask for the full amount of your budget from small donors or individuals. Set yourself a reasonable amount to ask for and cut your budget into chunks. Let’ say you need your trailer first. Perhaps you want to raise $10,000 for the shoots, the editor consultations and the final trailer edit. See Sara & Jesse’s trailer budget. What did it cost them? Compare your needs to theirs and get on the phone (as Norman Berns will tell you in his budgeting chapter) call and get your own prices for everything. Have a “kitchen sink” budget and a “bare bones” budget. You want both. Remember how creative you are when working on the film; well use that same creativity in raising money. Make it a fun thing, not a difficult one. It’s the life blood of the film. Using a fiscal sponsor lets your donor take their donation as an immediate tax write off and donors like this, especially for gifts of $250.00 and over. with a compelling story telling them why you are making the film. Then tell them what you need now, never alluding to the other $290,000 you may need. People can’t understand these numbers. They just want to make their house payment this month and your film may cost as much as their house. Give them a sticky story pitch. That’s under the chapter on film proposals. You need to tell them a story they can tell their mother, brother, father, boss and brag about donating to your film. Then those people may want to donate too. Keep your story short and simple. It must be easy to remember and repeat. “You are the carrier of too much information” says Dan and Chip Heath, authors of “Made to Stick.” Just give them the facts ma’am, just the facts. (If you can tell me which old TV show this quote is from, without looking on Google) I will give you a copy of my E book, the Art of Manifesting! In my chapter on getting discounts and donations from people in our industry, I tell you that the most important thing to remember when making an “ask” is “what’s in it for me.” The person you are asking is listening carefully to your “ask” waiting for you to tell him/her what you will do for them. You need to give something to get something. Make a list of things you can give people who donate to your film. If your film is like Amanda Mazzanti’s Seeds of Inspiration you may wantto cook deserts with the long-lost Maya seed that is found on the jungle floor and free to women in Central and South America. You bring those goodies to my house for desert and tell us about your film. For that we give you $300.00 or more. Let people have a dinner party with you as the desert maker. You can find more money at that dinner party than you can imagine. Money travels with money, they are close friends! scarf, stay in that creativity that brought you to the film industry. Everyone has to have urgency. I need this money by this date because…. Zealand was about a man 83 years old. We used his age as our “urgency” and it worked. and feel your passion for the project. to buy airline tickets ask people for their air miles. What is the core message of your film? What is the subject matter? creating partners and connect with their members to expand your outreach numbers. about and may be happy to be part of your film by supporting you financially. Ask friends and family to send this to 5 people they know. Tell them your personal reason for making the film. If possible have a personal trailer online they can see. Drive them to the Facebook page and web site to comment. Ask for the donation based on your current goal. Give them urgency. I need my trailer by 3/15 to get into Sundance. Give something back to them for supporting you. A rolling credit, etc. comments or use your Facebook page to respond to people.